The truth is there is a proof of millions of non-citizens registered to vote, but there isn’t proof that without those votes Trump would have won the popular vote. But looking for the truth is the whole reason for Trump’s call for an investigation. But what if there was proof? 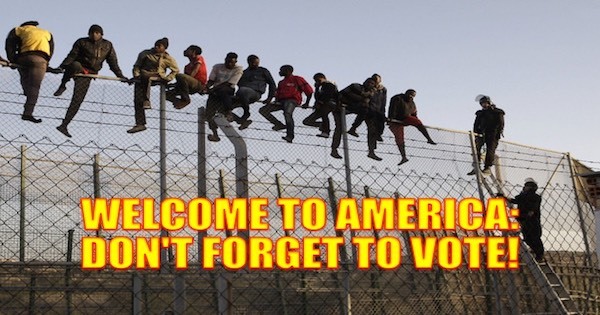 What if there was some indication of non citizens voting? No but there is however, proof that they were registered to vote, and in very large numbers. A 2013 study published by the journal Electoral Studies does just that, it provides enough evidence that President Trump is correct in saying an investigation is necessary. According to that survey nearly 2 million non-citizen Hispanics illegally registered to vote (and non-Hispanics would add more to that total). Inside the poll is a page devoted to voter profiles. Of the randomly selected sample of 800 Hispanics, 56 percent, or 448, said they were non-citizens, and of those, 13 percent said they were registered to vote. The 448 would presumably be a mix of illegal immigrants and non-citizens who are in the U.S. legally, such as visa holders or permanent residents. James Agresti, who runs the research company “Just Facts,” took the 13 percent figure and applied it to the 2013 U.S. Census numbers for non-citizen Hispanic adults. In 2013, the Census reported that 11.8 million non-citizen Hispanic adults lived here, which would amount to 1.5 million illegally registered Latinos. Accounting for the margin of error based on the sample size of non-citizens, Mr. Agresti calculated that the number of illegally registered Hispanics could range from 1.0 million to 2.1 million. Those number don’t consider that another 8.3 million non-Hispanic non-citizen adults were living in the U.S. in 2013, according to the Census. As the non-Hispanic non-citizens were not counted in Mr. Agresti’s research if one used the same ratio of voting as the Hispanic non-citizen registered voters the total estimate of total non-citizen voters could be as hight as 1.7-3.8 million. This is not a claim that it is that high (different ethnic populations vote different ways). Here’s the bottom line, while the research cannot prove how many non-citizens voted in the 2016 election, it does confirm the amount of non-citizens registered to vote may be 1.7-3.8 million, or even higher if non-citizens mis-represent themselves as citizens per the Demographic Research study. A different study led by Old Dominion University political scientist Jesse Richman found that about 1.3 million non-citizens voted in the 2016 presidential election (6.4% of the 20 million non-citizens) Richman estimated that 81% of the non citizens voted for Clinton, adding 834,381 net votes to her popular vote lead. None of this proves that President Trump is correct when he says non-citizen voting caused him to lose the popular vote. However, it does prove that President Trump is correct in calling for an investigation of voter fraud nationwide. One of the most sacred rights and responsibilities of American citizenship is voting. We are supposedly guaranteed that every person’s vote is worth as much as every other person’s vote. That guarantee has never been perfect, Blacks weren’t allowed to vote until the 15th amendment in 1870, and women until 1920’s 19th Amendment, but the tradition of the United States has been to aspire toward honest elections. There is evidence that there was a significant number of people voting illegally in 2016. Their votes made the votes of the legitimate voters less powerful than they should have, destroying the concept of one man-one vote. While the President’s number cannot be proven today, what has been proven is that a further investigation is needed. Perhaps it’s time for the mainstream media to read and investigate (in other words do their jobs) before they call the president a liar. There is some evidence that there were fraudulent voting, and we should applaud the president for calling for an investigation to guarantee the American tradition of one man one vote.